The Coupon Centsation: Glow Stick 100-Pack ONLY $6.99 Shipped!!!!! 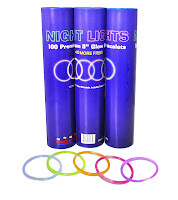 Glow Stick 100-Pack ONLY $6.99 Shipped!!!!! Wow! Amazon has 110 8" Premium Glow Sticks for only $7.99! These bracelets are great party favors for Birthdays and are prefect for camping and clubs. I am thinking that this would be GREAT for trick or treat kids this year!